The Stamp Gallery presents Vox Lacunae, an exhibition that investigates the boundaries between written language and visual art, and the boundaries between peoples in a globalized era. 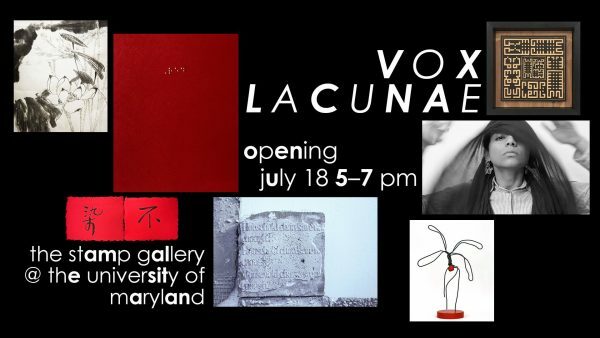 Vox Lacunae is the second exhibition at the Stamp Gallery this summer, and is curated by gallery manager Grace DeWitt, recent graduate from the University of Maryland, College Park. The exhibition is on view July 18 through August 22, 2018. An opening reception, free to the public, will take place on Wednesday, July 18, 5–7 pm. 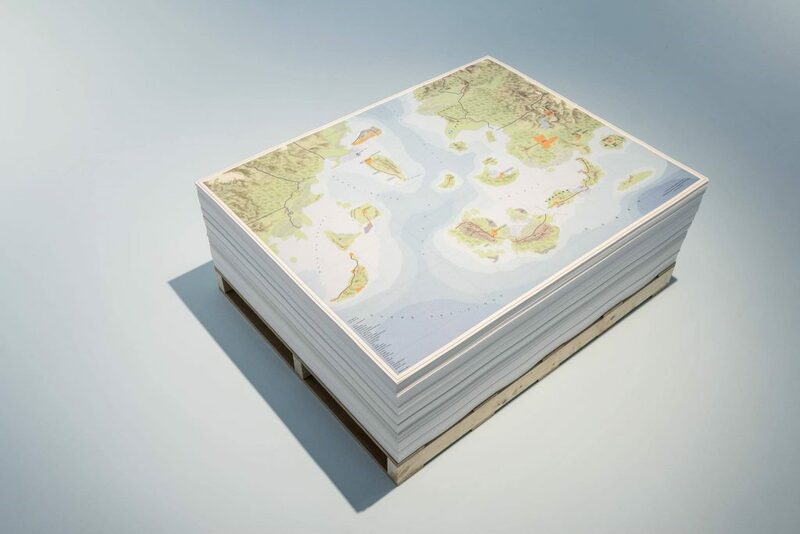 Vox Lacunae calls attention to the gaps that exist both among and within languages, and then asks: when are these gaps beautiful, spaces that should be left unfilled? When are they harmful, spaces that need filling? When do we use language to bring people together, and when do we use language to isolate them? Where do we separate language and visual art? Where do we unite them? And, ultimately, to what extent does emotion, artistic intent, and voice, transcend language? The exhibition presents work in a variety of media––including print, sculpture, installation, photography, painting, and video––by Sobia Ahmad, Sera Boeno, Marta Gutierrez, Nilou Kazemzadeh, Jason Kuo, Kim Llerena, and Yuli Wang. 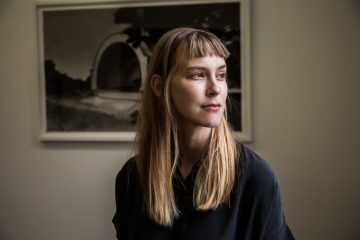 A pop-up library, created collaboratively with exhibiting artists and the Art Library at UMCP, will be available in the exhibition for visitors to investigate related concepts further. An incubator for emerging artists and curators, the Stamp Gallery regularly presents exhibitions curated by undergraduates. 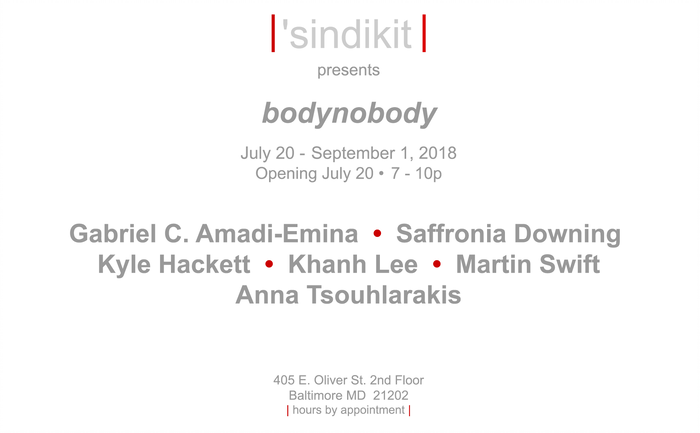 Recent student-curated projects include capital lives curated by Katherine Mullineux (UMCP ’18), and I’m Fine, curated by Sarah Schurman (UMCP ’18) and Tasiana Paolisso (UMCP ’18). This is an exhibition that gives the artist and the community the opportunity to examine and reflect on the question of TRUTH(s) – what constitutes a truth in the contested times in which we all live? The second decade of the 21st century in America and the World continue to witness a marathon of troubling events that test the limits of our faith and hope in humanity. Information is channeled a through so many varied sources one does not know what to expect or how to deal with the erratic events that have become global. 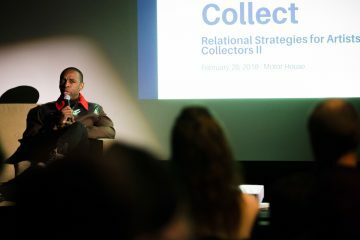 This is a rich mind field for the artist – in all media – to draw attention to the role that “TRUTH(s) – Real, Imagined or FAKE” play out in our daily lives. The Motor House Gallery is open to the public in conjunction with Showroom Bar hours. The Baltimore Office of Promotion & The Arts announces the details for the 37th annual Artscape, America’s largest free arts festival. Artscape returns Friday, July 20 through Sunday, July 22, 2018 to Mount Royal Avenue and North Charles Street in Baltimore, MD. Artscape is open from 11am to 9pm on Friday and Saturday and 11am to 7pm on Sunday, with Artscape After Hours taking place Friday and Saturday from 9 to 11pm. In recent years, Artscape organizers have applied an overarching theme, relevant to both the arts and Baltimore City, into the festival’s creative thinking. In 2018, Artscape is going back to the basics…ART! For “the year of no theme,” Artscape encourages artists and festivalgoers to embrace Artscape for what it is: a fully accessible, free world-class arts festival in the heart of Baltimore City. The 2018 festival is headlined by legendary girl group TLC on Friday, July 20 at 7:30pm, reggae group Toots & The Maytals Saturday, July 21 at 7:30pm and blues rock sensation ZZ Ward on Sunday, July 22 at 5:30pm at the MICA Main Stage. Also, Dance returns to the Modell Performing Arts Center at The Lyric with Garth Fagan Dance from Tony Award-winning choreographer Garth Fagen. A full schedule of events can be found on www.artscape.org. New to Artscape this year is Youth Day, taking place on the festival’s opening day, Friday, July 20. On Youth Day, Artscape features a variety of performances and visual art by Baltimore youth artists, makers and performers at indoor and outdoor venues. A performance by the Cardinal Sheehan Choir takes place for Youth Day on the MICA Main Stage at 4:30pm. Also new, festivalgoers can have a dance party via their own set of headphones at Artscape’s new Silent Disco featuring some of Baltimore’s best DJ talent. For the first time ever, Artscape is pleased to offer FREE Pedicab rides to festivalgoers who wish to see the Artscape their missing by bicycle. Artscape is pleased to welcome Squonk Opera who brings their show Pneumatica to Artscape for three days of performances. In this show, the “Squonkers” pump up the volume with live original music that permeates the air, while inflatables pump up and immerse the audience. Other new Artscape components include Teenscape, a section dedicated to teen programming presented by BOPA’s Youth Arts Council and a new Kidscape performance space. Artscape features 11 large-scale artwork projects for festivalgoers to explore, interact with and admire throughout the festival footprint. Among these projects are Trash-scape, by the Department of Beauty Maintenance and Thick Air Studios, which is an evolving street performance surrounding a sculpture of recyclable material in the shape of a mandala. Also along Charles Street is Choose Your Own Adventure by Becky Borlan & Graham Coriel Allen, which transforms an intersection of Charles Street into a colorful and safe pedestrian playscape of creative crosswalks and an immersive environment of floating beach balls. Some projects have a very specific tie to Baltimore like Screen Station, where festivalgoers will be able to try their hand at screen printing and print their own messages related to youth advocacy and justice. Another art installation worth exploring is Headspace by Magdalena Sudnik, which is a giant wooden head people can walk through and engage with others from the inside. More artwork is on view at the Artist-Run Art Fair, which transforms the parking garage at 1714 North Charles Street into a showcase of contemporary artwork from artist-run galleries from across the country. Two additional visual art exhibitions, How-to and Open During Construction, are on display indoors at MICA’s Dolphin Gallery (100 Dolphin Street) and MICA’s Pinkard Gallery (1401 West Mount Royal Avenue). 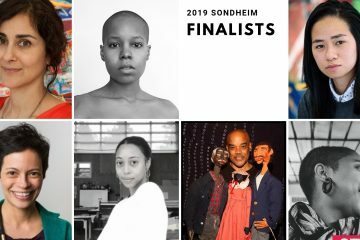 Festivalgoers are also encouraged to view the work of the Sondheim Artscape Prize Semifinalists at the exhibition at MICA’s Decker and Meyerhoff galleries (1301 Mount Royal Avenue). For those looking to purchase art, the Artists’ Market along Mount Royal Avenue features handcrafted items from more than 100 visual artists, artisans and crafters from the Baltimore region and beyond. 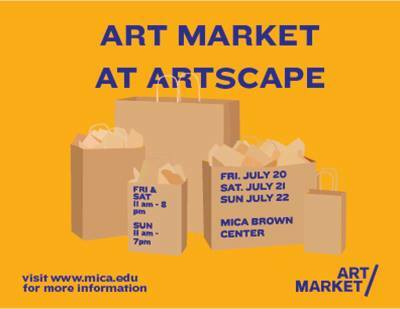 Attention lovers of art: Stop by the Summer art market at MICA! Shoppers have the opportunity to discover work by emerging and established artists and designers. Nearly two-dozen MICA students, alumni, faculty, and staff sell fine art and handmade objects. 15% of all vendor profits will be going towards MICA student scholarships.